NEW YORK--(BUSINESS WIRE)--Clear Channel Airports (CCA), a brand division of Clear Channel Outdoor (CCO) (NYSE:CCO), and a subsidiary of iHeartMedia Inc., announced today the results of a comprehensive consumer insights study, showing airport advertising offers consumers a great opportunity to absorb and respond to brand messaging. 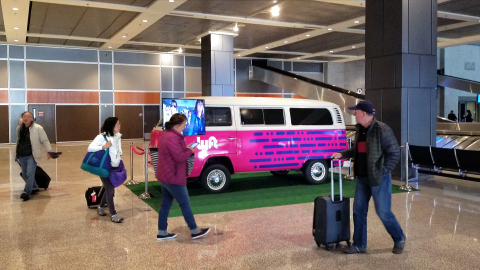 The CCA-commissioned Nielsen study reveals airport advertising is a highly effective media platform that reaches frequent flyers, tourists and business travelers and raises brand awareness while driving sales to local and national businesses. The study provides insights into frequent flyer responsiveness to airport advertising, the types of activities travelers engage in while waiting for their flights, and what actions consumers take after being exposed to airport advertisements such as social media activity, in-store retail shopping and e-commerce activity. The study’s findings come on the heels of Clear Channel Airports (CCA) successfully closing on a series of impressive wins for the organization. Since 2015, CCA has announced significant new partnerships and concession renewals to provide comprehensive media programs with advanced digital capabilities to airports, including, Washington Dulles International Airport, Reagan National Airport, Minneapolis – St. Paul International Airport, Punta Cana International Airport, Austin Bergstrom, Atlanta-Hartsfield International Airport, Nashville International Airport, Honolulu International Airport and Santa Barbara Airport. Other major airport partnerships include Chicago O’Hare and Denver International -- two of the nation’s Top 5 busiest airports. Nielsen study confirms airport advertising drives sales for national & local brands. 19% buy a product advertised at the airport.